We invite you to become a Member with a pledge of at least US$1,000. The main benefit is that you'll be playing a key role in bringing the essential teachings of Lama Yeshe and Lama Zopa Rinpoche to tens--perhaps hundreds--of thousands of people all over the world. As the thousands of us who have benefited from the Lamas' teachings will attest, they are extremely effective and totally relevant to the world today. Making them available in all the ways we do -- through our books and on our website, in print and in audio -- is one of the greatest contributions to peace and happiness in the world we can make. ♦ A free copy of each free book published by LYWA in the future. ♦ A free copy of each Lama Yeshe or Lama Zopa Rinpoche book edited by the Archive and published by LYWA or Wisdom Publications for sale in the future. ♦ Any of our DVDs in stock sent to you for free by request. ♦ 50% discount on Adele Hulse’s Big Love, the official biography of Lama Yeshe, to be published by LYWA. ♦ One year subscription to FPMT’s bi-annual Mandala magazine, including a PDF of the magazine and the Mandala ebook. • Light offerings on the four great Buddhist festival days over one year in Bodhgaya. ♦ Access to the entire LYWA library of books and DVDs in digital format in our Members Area. Books will be available to members in pdf and ePublishing formats. 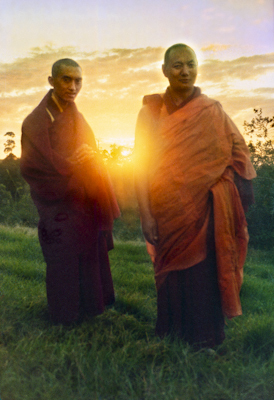 ♦ Access to selected print quality images of Lama Thubten Yeshe and Kyabje Lama Zopa Rinpoche, which may be downloaded for personal use. Read more about the membership program, and the work your membership supports. We hope you will be able to join. If you cannot manage $1,000 all at once, we offer you the option of donating $250 a quarter over the next year, $100 a month for the next ten months, $50 a month for the next twenty months, or "a dollar a day" ($30 a month for 34 months). ♦ You may make your payments on your own each month from here, or send a check to LYWA, PO Box 636, Lincoln, MA 01773 USA. Special Appeal! Make a Membership payment of US$1,500 and receive all the benefits listed above, PLUS a limited edition print of Lisa Sawlit's spectacular portrait of His Holiness the Dalai Lama. See our special appeals page for more details. Give the Gift of Membership! You can arrange to pay for a membership in another person's name. Just let us know in the Comments section when you are checking out and we will contact you for all the details. Please note that we cannot begin your pujas and Mandala subscription, or automatically send you any of our new books or DVDs for sale, until we have received at least $250 towards your membership. Also, if you need to discontinue your membership before it is paid in full, we will keep you listed as a Benefactor for one year from the date of your last payment. Thank you so much for your support of the Archive! 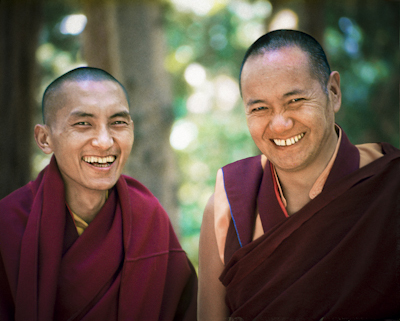 Thank you so much for supporting the Lama Yeshe Wisdom Archive with your membership! 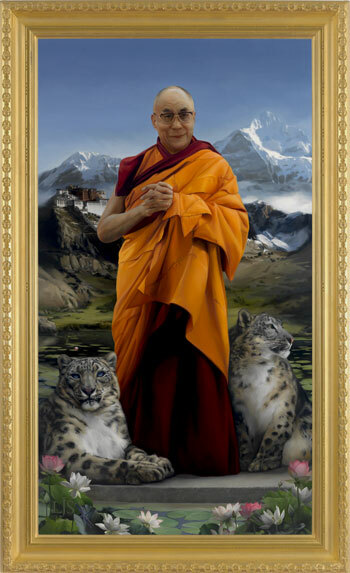 With this special membership donation, you will receive a limited edition large-sized print of artist Lisa Sawlit's spectacular portrait of His Holiness the Dalai Lama. Thank you so much for supporting the Lama Yeshe Wisdom Archive with your membership! Play a key role in bringing the essential teachings of Lama Yeshe & Lama Zopa Rinpoche to people all over the world.